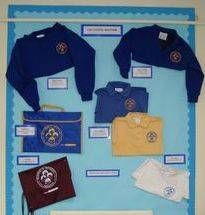 Our uniform is blue and gold with a variety of options for boys and girls. There is a section all about uniform if you look in our prospectus. However please see the photograph on the right of this page which will show you a display of what is available. We are in the process of changing our uniform supplier to Personalise, in Witham High Street. They will stock all of our embroidered clothing items and our book bags and PE bags. Orders can be made online or in person at the shop and can be delivered direct to your house. Water Bottles are still available from the school office. We also sell second hand uniform at Parents' Evenings and other events, and are very grateful for donations of clean uniform your child may have grown out of. We sell on items at very low prices to help other families and all proceeds go to School Fund to contribute to special events and activities for all the children. Thank you.